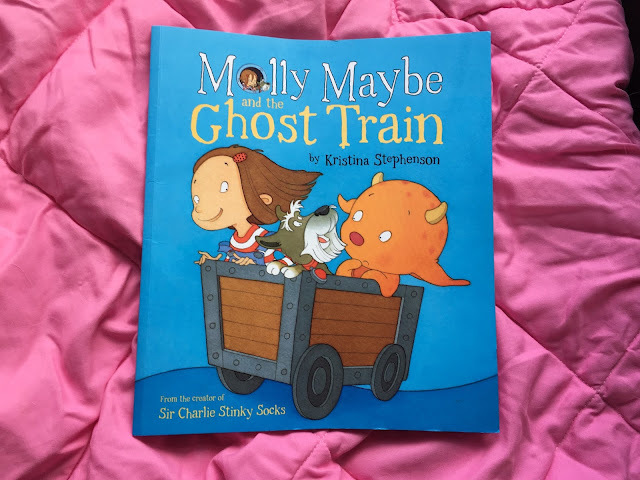 When you hear a book has a main character whose name is the same as your child's it is inevitable that you want to own it so when I saw the chance to review the book Molly Maybe and the Ghost Train by Kristina Stephenson I immediately agreed. Molly and her pet dog (and fellow adventurer), Waggy Burns, want to find out why some monsters are making a horrible pong. 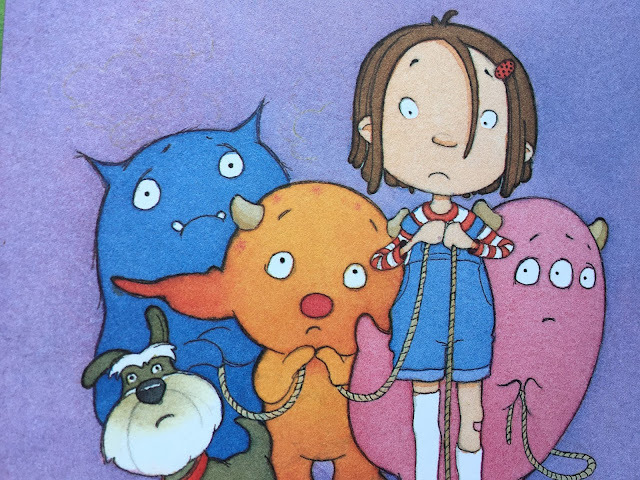 You see monsters make a smell when they are scared and Molly and Waggy want to know what is scaring them. They step inside the mundervator, an amazing machine that takes them deep under group, which can be found under Molly's tree house and they travel deep into the undermunder (the monster world underground). It turns out that the monsters are scared of the the ghastly ghost, Ghoulie Gumpus, and Molly and Waggy Burns set out to help the monsters overcome their fears. But will they succeed? What I loved about this book was that M really got into the story. I was worried it might be a bit of a long story for her and the first time we read it she did only listen to the first few pages. It seems that was just unlucky timing as since then I have had to read it cover to cover, over and over. 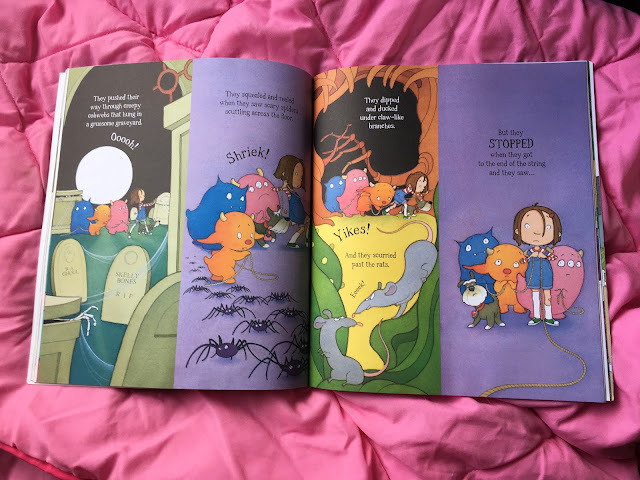 She talks about the pictures on each page, loves the monsters and of course identifies herself as being Molly Maybe and Waggy Burns she pretends is one of dogs. I love that when I ask her what is happening that she tries to explain, the best way she can. She even loves to skip to her favourite parts (the part where you have to turn the book as they do underground and when we meet Ghoulie Gumpus). She has even rushed off to get pen and paper to draw just like Molly and Waggy to towards the end. The illustrations are adorable. Nice and bright and unfussy. Some pages lack in detail for the back ground, which I think is excellent as it makes the busier pages even more exciting, to match the story. The emotions of the characters are great and M loves to ooooh and shriek in all the right places. What a great book, and perfect for Halloween! Guess what book series we are going to be collecting from now on?!? 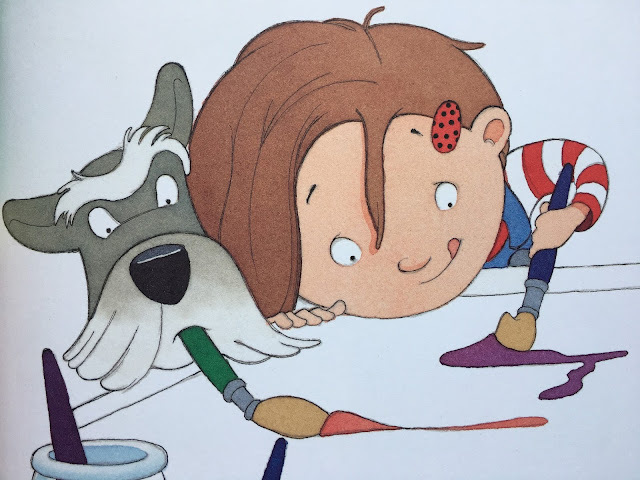 There are a few excellent free resources to keep little ones busy. The first is a card, designed for children to give their friends at nursery or school. There is also some amazing activity sheets available with puzzles and drawing activities. We were sent this book in exchange for an honest review.